Today (14th October) is the 950th anniversary of the battle that proved to be a monarchal, social and institutional crossroads in the history of Britain. I could hardly let the day go by without putting my Hastings boardgame on the table. The following post shows highlights of today's play and provides links to system notes and previous replays. Who will win the day? ....... this time! Please tap the 'read more' tab for the rest of this post. 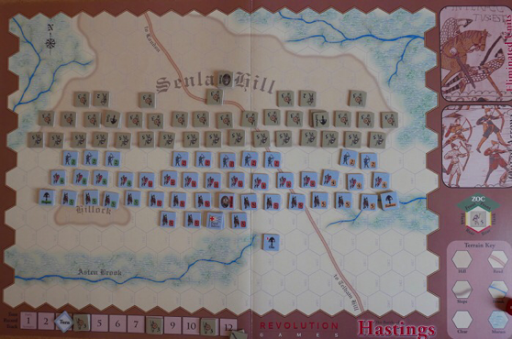 Invasion 1066, The Battle of Hastings is a small footprint hex and counter wargame that I designed some years ago and put out as a Desk Top Published game and in late 2014 Revolution Games kindly put it into print. The system and nature of play has been previously discussed in some detail. Those links are in the resource section at the foot of this page. Set-up - I prefer the historical set-up, though there are other scenario start options. This set up is fixed, other than the four Anglo-Saxon reinforcements being randomly applied to the turn track (turns, 4, 4, 8 and 11 on this occasion). Note this is a 12 turn game and in the historical scenario, we start at turn 3. Opening turns - The opening Norman archery disorders two Anglo-Saxon Housecarl units, though four of the archer units go 'out of arrows' and are removed to the archer holding box. Norman heavy infantry advance to contact those disordered enemy units, which now have reduced combat values. On the left (Breton), they push through and get a lone unit onto the slopes of Senlac Hill, but in the middle (Normans) the attacking infantry are decimated on the shieldwall. In reply, the Anglo-Saxons discharge their hand thrown weapons (one off event in the game) and crucially disorder a Breton unit that is about to press into the flank of a Housecal formation. As the Bretons keep the pressure up, most of their contingent become disordered due to the rigours of combat and pull back some units to re-organise. Mid game - While the Bretons are putting the Anglo-Saxon defences to severe test, over on the right, the Franco-Flemish contingent under Eustace face disaster. 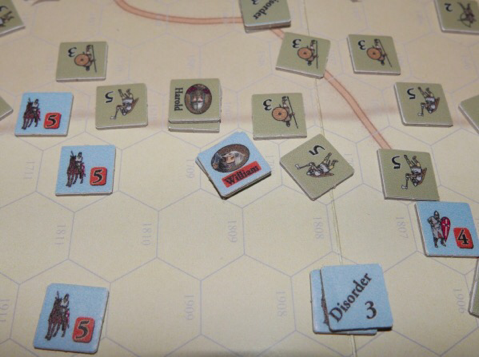 Their initial assault on the hill had resulted in heavy casualties and a second attempt has caused further casualties together with the loss of their leader, Eustace. As the adjacent Franco-Flemish units test their morale, two of those units rout at the very sight of this carnage and the loss of their leader. Taking immediate advantage of this local collapse, Leofwine comes off the slopes, bringing a mixed force and jabs into the now expose Norman right flank. A second wave follows as more units (mainly General Fyrd) are confident enough to leave the safety of the hill and feed into the attack. In the confusion a Housecarl unit pursuing a retreating unit (mandatory advance after combat), finds itself in the morass (wet lands around Asten Brook), automatically becoming disordered. The Normans face a tough decision. Should they call a lull? 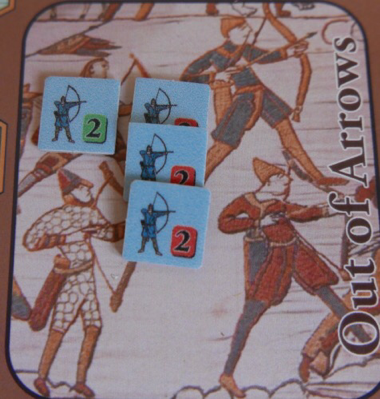 This will allow them to fall back, re-organise and get their archers 'fully supplied' back into play. But although they are taking a hammering on their right wing, their left (Bretons) have got onto the hill and are causing the Anglo-Saxons a great deal of consternation. They decide to keep the fight going. The first of the Housecarls rout comes when they are attacked by Norman cavalry carrying the Papal Banner, as William tries to firm up the right flank. The two armies are starting to turn on their centre with the Anglo-Saxons pushing the Norman right flank back, while their own right flank is retreating and in danger of collapse. 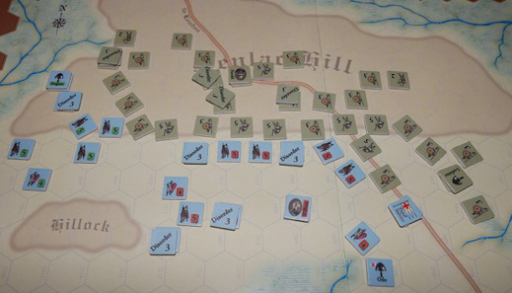 End game - As casualties escalate, most attacks are resulting in the routing of neighbouring units. 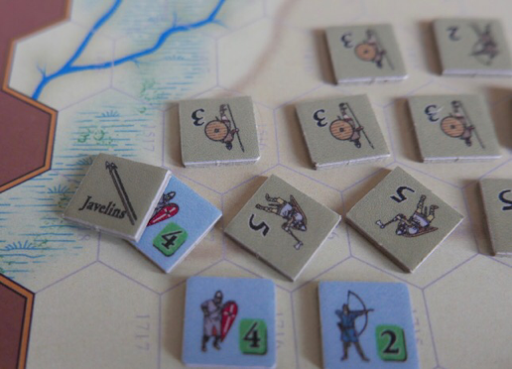 The situation presently favours the Anglo-Saxon player, but with the Bretons making firm gains on the Norman left, they are inclined to 'hang in there' and see which way it goes. In their part of the turn, the Anglo-Saxon right flank manage to get units of the General Fyrd together to at least maintain a solid front. It's not a strong position, but it will frustrate the Bretons for at least another turn. 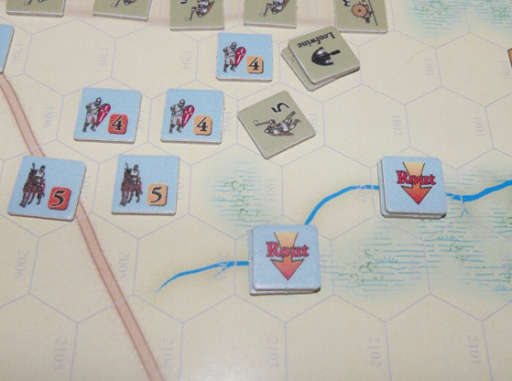 Bishop Odo in the rear by the brook, manages to halt some routing Norman cavalry, but overall the Norman situation is deteriorating and as it worsens, William directly intervenes. He takes his cavalry against some nearby Housecarls and crashes through them, getting drawn in closer to the enemy line. Harold can see an opportunity to strike at William and his bodyguard and falling upon the enemy flank, he takes his own Housecarl bodyguard into the melee of swirling axes and sword to engage in personal combat. William is brought down from his horse and killed, bringing the game to a halt under the 'sudden death' victory conditions. So there we have it, on the 950th anniversary, an Anglo - Saxon victory, taking history to who knows where. Conclusions - Well this was a shorter game than most with three turns still remaining, but that early devastating loss to the Norman right, inviting Leofwine to come off the slope and attack the exposed flank was no doubt the undoing of William. Despite this, his own assault on the hill was going unusually well on the left flank and really they were only a turn or two behind the Anglo-Saxons in being able to turn the enemy flank. The early intervention of Willian, followed by Harold shows the desperation of the moment as leaders in any combat must always test for loss, which follows on a '1' and in the case of the Harold and William, their loss results in a sudden death victory for the other play, so involvement is always a balanced risk. Since the hand of fate ended the game, I thought I would look at the secondary means of winning to see how well the sides had done. 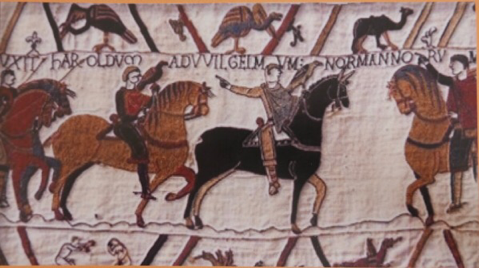 The Normans had racked up 45 VP's while the Saxons went ahead on 49. Although this looks tight, the Normans need to be 10 points clear of the Anglo-Saxons for a win, anything less is a win for Harold. Firming this up, the Anglo-Saxons had managed to get down to the important gap (the road passes through it) at Asten Brook, putting them adjacent to the hexrow that would have given them substantial victory points for cutting the Norman retreat path along the road back to Telham Hill. Having said that, the Norman penetration on the left flank had also brought them adjacent to the hexrow that would have given them similar victory points for unhinging the defensive position. So all in all a shorter game than usual, but one that had plenty of the characteristic suspense of going down to the wire. We didn't get any examples of Anglo-Saxon impetuous counter attacks, or Norman cavalry charges, or feigned retreats and a lull turn was not called for reorganisation of the armies, but we did see Bishop Odo doing his stuff on that fragile Norman flank, which was rather nice. I am looking at doing 12mm figures for both sides and doing a slightly condensed version of the game for the tabletop (on hexes) using these rules as the basis for play - so hopefully that will come to something and be the subject for a future post. Anyway, a fun game played as part of the celebrations of a significant anniversary. Enjoyed reading through the battle report. Interesting seeing the battle unfold in an unexpected but plausible way. How different would the world be if that result had happened on the day?! Thanks for an entertaining report. I see you have produced both Hastings and Stamford Bridge; do you have any plans for a Fulford scenario as well? Thanks gents. A 'different world' is an interesting question, I am not qualified to answer that, but the national identity was changed forever. I have often been asked about a Gate Fulford to round off the 'three battles', but my concern has always been that it would not offer anything ing significantly different from the the first two games and would be quite close to the 'hack 'n slash' nature of the Stamford game. It just seemed unreasonable to ask people to pay for something that did not bring something new to the table. Hastings and Stamford share the same system, but a very different games, hastings is a hard grind to take a position and Stamford becomes a free-flowing hack 'n slash affair. 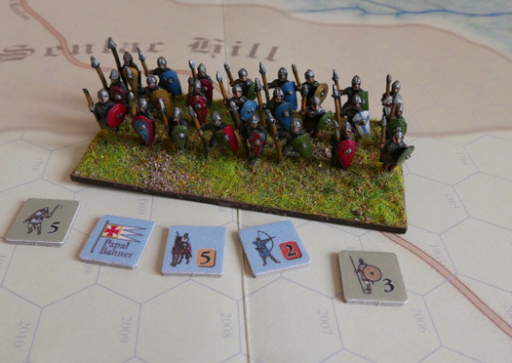 I did fancy doing a crusades game as this would allow the cavalry rules to be high lighted in a way that neither of the two 1066 games did, so in that regard would have a fresh feel. I would at some point like to see whether the system would travel as far as chariot armies, as again this would be fresh. for a log time I have always fended off the question, having not enough 'fire' to do another design, but recently it has at least been in my thoughts on a few occasions. A very interesting game and report, thanks for putting up. Just wanted you to know that the huge royalty cheque you recently received is the result of my successful campaign to have my family buy a copy of the game for my upcoming birthday! Woohoo! No need to thank me--it's all part of my being a loyal war gamer as well as a wonderful, deserving husband and father. Thanks Chris, I hope it meets your expectations. have a great birthday. Thanks for the link! It makes me looking forward even more to playing.